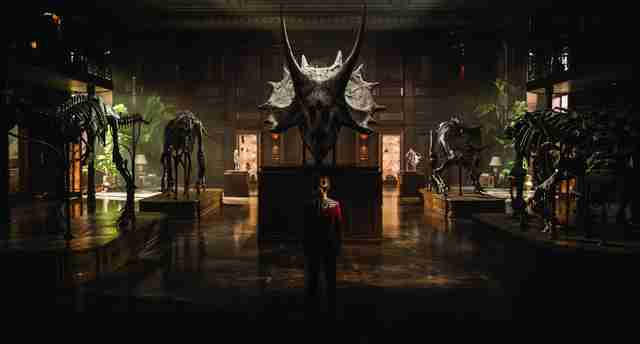 This article contains light spoilers for Jurassic World: Fallen Kingdom. I like to imagine a bunch of movie executives around a large table, Chinese food cartons everywhere, the boss pacing, shouting, "Come on people, we need ideas!" How to keep the Jurassic franchise going when this already implausible series has, regardless of its profitability, become parody? There can't be another park, and people just can't stumble onto the island. What about, I dunno... activists? Those troublemakers are always complicating things, right? "Sure thing, boss, the activists!" And thus, extracted from the amber of laziness, enough of a story to propel the summer sequel to 2015's Jurassic World emerges. The island, you see, is on an active volcano, and it's about to spew. All that hubris will do it, I guess. When the island dies, so will its inhabitants, and they include every resurrected dino that munched up tourists from the last movie. Let them sink? Most sane people would say yes. But in Jurassic World: Fallen Kingdom, not the granola-chomping twerps of the Dinosaur Protection Group led by (surprise!) Claire Dearing (Bryce Dallas Howard), the Jurassic World exec from the last movie now lobbying Congress to save the dinosaurs from going re-extinct. She gets an offer from a bedridden multizillionaire, Benjamin Lockwood (James Cromwell), via his majordomo (Rafe Spall). His private military will extract the dinos from the dying island and place them somewhere safe. (Should Claire trust this? Director J.A. Bayona may as well flash "Don't trust them!" across the screen.) But for the mission to be successful, there's someone she'll need on her team. Cut to Chris Pratt's Owen Grady, dinosaur trainer extraordinaire, off in the wilderness, hammering wood beams together to build a house. They leave Owen's enclave, and Claire brings two of her nerdlinger pals along with them (a "paleoveterinarian" and a computer hacker whose primary function is to rap-a-tap on a keyboard and say, "We're in!"). Then comes the double-cross and, even though it is set in one of those dumb hamster balls from the last movie, it's one of the more terrifying action sequences in any of the Jurassic movies. If there's a big twist in Jurassic World: Fallen Kingdom, it's that most of the movie isn't set on an equatorial island. Via a series of ships and trucks, the action heads back to Lockwood Manor, a mix of Collinwood Mansion from Dark Shadows and a prefab underground science lab from a horror movie mail-order catalog. The castle is home to Benjamin Lockwood and his moppity granddaughter (and has a room built to resemble New York's American Museum of Natural History), but in the basement, an assemblage of the world's most short-sighted money-crazed Icaruses gather, bidding for ownership of uncontrollable, ravenous, and murderous dinosaurs! Behold the Ankylosaurus, bashing into everything like a tank. If it could be trained, its DNA would beget an all-but-unstoppable army. Up goes the paddle of the Slovenian (???) arms trader. And then there's the Indoraptor, a hybrid of the Indominus Rex (remember that guy?) and a Velociraptor (oy! them again? such menace!). Auctioneer Mr. Eversol (Toby Jones) initially only wants to show the still-in-development Indoraptor off -- look at next year's model! -- but the Forces of Evil must have him now, Now, NOW! It all goes poorly. Mayhem strikes the manor, Lockwood's granddaughter is tormented in her own room by a beast with giant sharp teeth. There's running, there's smashing, there's leaping, there's the bit where a dinosaur slowly opens a door handle, there's a tremendous deal of fun. I laughed, I yelped, I shouted, "Oh, no!" The whole theater did. Dinosaurs rule. This is what is key to Jurassic World: Fallen Kingdom. The movie is stupid, but it is a success. And I'll gladly watch it again. I can't say the same about Jurassic World; that movie took itself way too seriously. It felt the weight of bringing Spielberg's successful series back to the marketplace, and as such, it tried -- and failed -- to escape the trappings of a typical B-picture. Fallen Kingdom doesn't care about being meaningful. It's an afternoon film, a big-budget production of a low-budget script. It's a throwback to a kind of disposable sequel that goes down easy. It's not Bride of Frankenstein, which is thoughtful, but Son of Frankenstein, which just kinda shows up if you are at a horror festival. It also ends with the best whopper of a cliffhanger outside of the MCU (one that makes you say "aha!" at the title) and has me bouncing with excitement for the next installment, which I would not have said after the last film. Welcome, J.A. 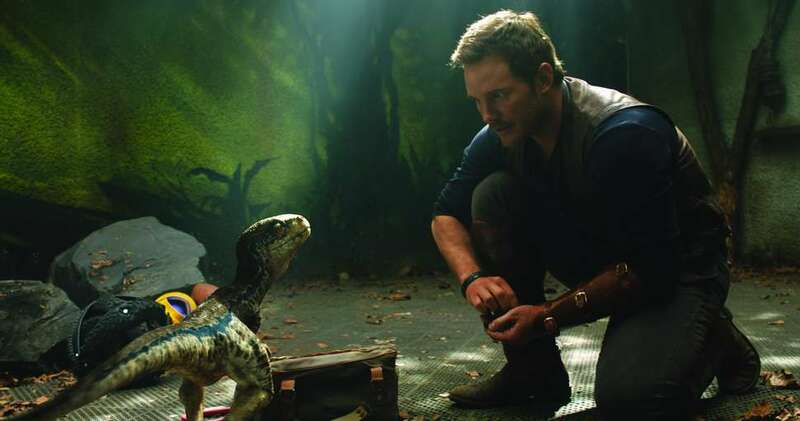 Bayona, to Jurassic World, and the A-list of summer tentpole moviemaking.